Perhaps you have noticed there are several exciting doll auctions going on right now that will be ending this weekend? 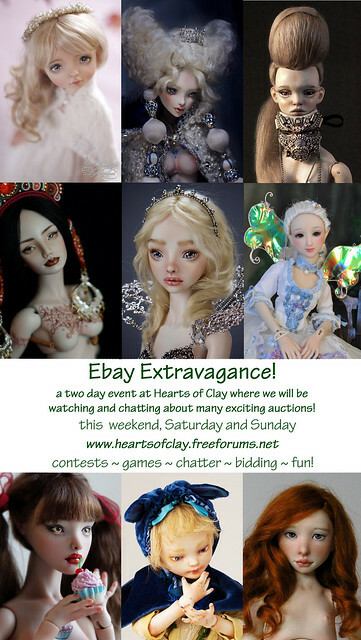 These artists are at different places in their careers, but each auction represents something special, whether it is an opportunity to buy a very rare and expensive doll, as with Cinderella, or a first for an artist, as with SisterFox's first resin doll, Peony. So we are organizing a little event for this weekend to celebrate each artist and watch the auctions together. -the start of our first contest! To see the time for the event in your time zone, click here or view the countdown here. I hope you will all join us this weekend and participate in the fun! The Shoutbox (chatroom) is at the bottom of every page on the Desktop version of the forum. I'm inviting another doll auction to our Ebay Extravagance party, the lovely Daisy, a Serenity Kingdom doll by Anna Tide! The Visonary Doll seems to be quite similar to Popovy's Sisters dolls... don't you think? What fun! And my goodness, there are so many beautiful dolls to choose from! I wish I was rich! If this is going to be a January trend, I am cancelling Christmas next year so I can bid!!!!!! Yes she looks awesome so far! Porcelain BjD doll "Nina" and "Snow" from Divine Creations. We have a few more dolls to invite to our party! Yes amoreen, I see some similarity to Popovy sisters dolls, especially in the wig. I have not heard of this artist before this auction and the website is very small right now. 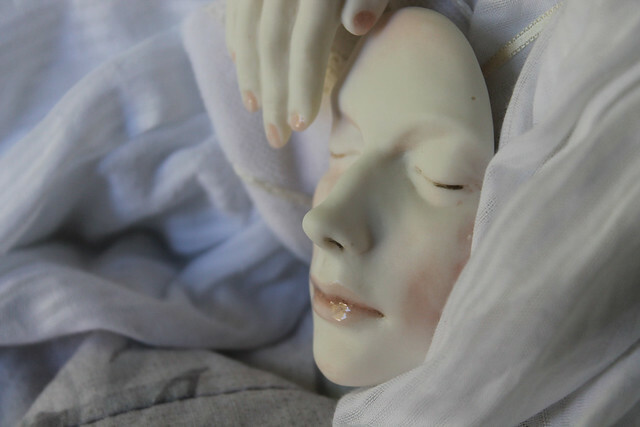 I think this may be the first doll by this artist, how exciting! Plus we will have so much fun! I have decided to host a giveaway for a custom jewelry creation, and it will be very easy for everyone to enter to win. Come around Saturday morning for some details! Thank you Allurerose. Wow, 14 different dolls to chose from, it's a lot!!!!! 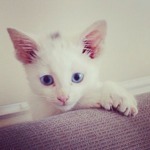 Some of them are gorgeous and very sweet!!! Oh that's very interesting! I just assumed it was the first doll since it was the only one I saw on the website. I am always learning new things about this hobby. Yeah, I don't have money for dolls either right now, it's so sad! Especially when that Serenity Kingdom doll is one of my dream dolls...but bills come first! Oh I so wish I could get serenity kingdom! But her popularity made it so I don't think I will be obtain her in the future. Unless the price doesn't go any higher, which is wishful thinking. I will see, in a year or so. Serenity is one of my dreams too- And I love her full sets- oh well maybe one day. I have wonderful news! Our own Hansel, an incredibly skilled doll artist and sculptor, has donated a prize for our giveaway this weekend! 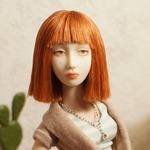 The prize will be a porcelain doll part of your choice made into a piece of human jewelry such as a necklace or brooch. A great opportunity to win a piece of porcelain art! More details will be posted Saturday morning so stay tuned! This is an exciting week for me to have joined I think! I'm looking forward to joining in with this.